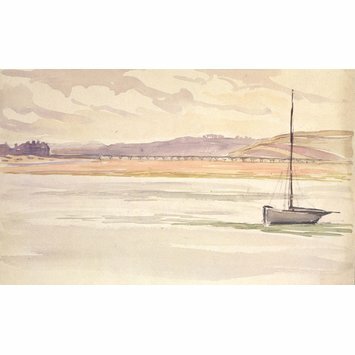 Beatrix Potter (1866-1943) made some bold watercolours of the south Devon countryside, including a number of views of Teignmouth. Following her 1892 visit to the town she said in her journal: ‘I looked with interest across the muddy estuary at Teignmouth where Fanny Burney wrote her sprightly journal in 1773…’ Potter also visited Teignmouth in 1909 and 1910. 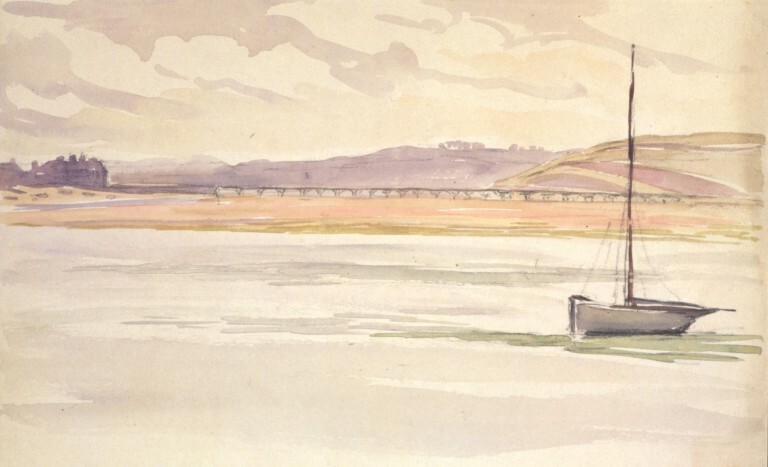 A drawing of a small boat on a river, across which a bridge can be seen, completed in watercolour over pencil on paper. The foreground is comprised of the river and boat, while the upper part of the landscape composition denotes a wide bridge over an estuary, with distant hills beyond. Inscribed on verso according to the referenced catalogue; this could not be checked at the time of cataloguing due to the sheet having since been laid down on heavy paper. Drawn by Beatrix Potter in Teignmouth. Acquired by the V&A from Leslie Linder (1904-1973) in 1973 as part of the Linder Bequest, a collection of ca. 2150 watercolours, drawings, literary manuscripts, correspondence, books, photographs, and other memorabilia associated with Beatrix Potter and her family. Watercolour and pencil study of a boat on a river, with a bridge over an estuary. Made by Beatrix Potter in Teignmouth.